Normally I would be writing about a bolt of beautiful fabric. Instead there is another “Bolt” that is very important to my family. Since I am am writing daily, I thought it would be OK to write about how I get money for beautiful bolts of fabric. I have a very talented husband who’s artistic skills many people have enjoyed while watching Disney animated features. Well I just wanted to let my 2 readers know that he did all the original paintings used in the background, think matte painting, for the “Bolt” movie that opens today. He also does digital camera work as a layout artist, but I don’t know the specifics well enough to be able to write about that. He brought home printouts of some his paintings for me to see and on the side of one of the trains he used my initials. Isn’t that sweet. The paintings get sent to other departments after he is done and can be changed, so the initials may not be in the movie. 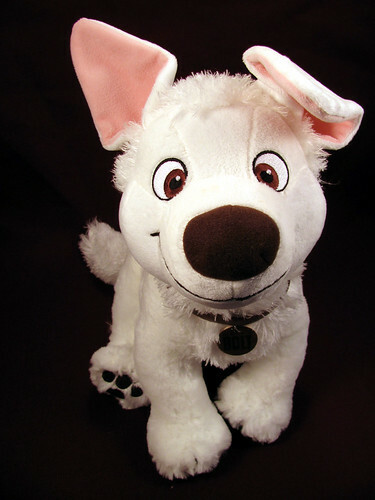 He also gave me this adorable stuffed “Bolt” which I photographed this morning. It is so soft and its feet are creatively embellished with pads. Please see the movie this holiday season. How can you say no to such a cute face? This entry was posted on Friday, November 21st, 2008 at 12:01 am and is filed under Life. Tagged: Life. You can feed this entry. You can leave a response, or trackback from your own site.